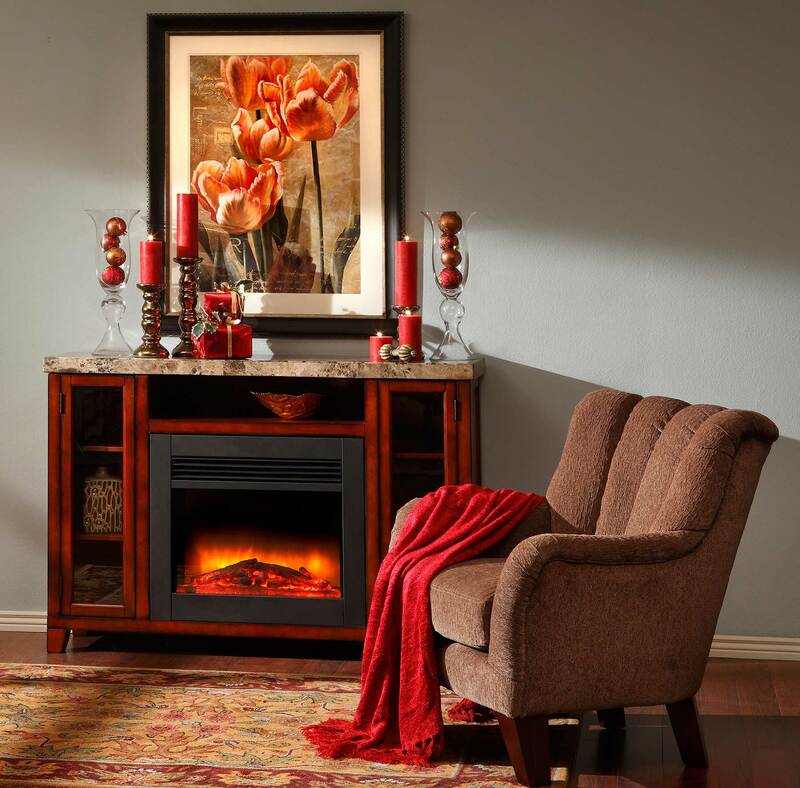 Electric fireplaces modernize hearth and home. Love your house, but wish it had a fireplace? You don’t have to endure the hassle and expense of installing a working chimney. An electric fireplace is an easy, affordable way to bring the look and feel of crackling logs to your living room — or any room of your house, for that matter. “A freestanding electric fireplace is a quick, easy way to warm up your home — perfect for the holidays,” says Sofa Mart buyer Gay Lehnerz. There’s no remodeling or complicated fuel hookups required — simply situate the fireplace against a wall, plug it in, and use its remote-control button to adjust the brightness of the simulated logs and flame. The same remote also controls the fireplace’s heat. Typically, they operate at either low (750 watts) or high (1,500 watts) power, and distribute up to 4,600 BTUs of heat to effectively warm up a 200-square-foot area. What’s more, you can turn off the heater completely to enjoy the look of a roaring fire when the outside temperature soars. Try that with a regular fireplace. Unlike regular fireplaces, console fireplaces can be coordinated with the rest of the furniture in your room. Montebello Electric Fireplace @ Furniture Row. Console fireplaces are ideally suited for today’s flat-screen TVs. No more than 17″ deep, their slim profile won’t “swallow up” a TV the way some big, bulky entertainment centers do. They also look great with the TV mounted on the wall above, leaving the top surface free for electronic equipment or anything you might place on a conventional fireplace mantel. Starting at around $600, console fireplaces can be added to your home for a mere fraction of the cost of installing a wood-burning or gas fireplace. 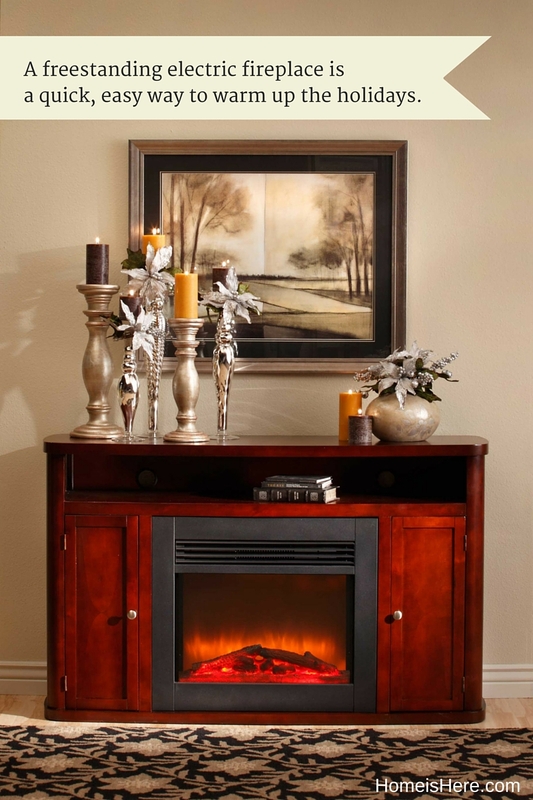 And, unlike regular fireplaces, console fireplaces can be coordinated with the rest of the furniture in your room. Match finishes and styles with occasional tables and other pieces in the room.